First, full disclosure: the gigantic metropolises are rarely my favourite part of any country, and Manila is no different. It was definitely a real interesting experience though so I’m going to write about it and I apologize if it’s a bit, well, sarcastic and pouty? This is not my overall opinion of the Philippines, I swear! So, here goes. Manila was the first stop we made on our trip. We made it there after 25 hours of travel with all our stuff present and intact (though Chris ALMOST forgot his camera in Tokyo and I’m never going to let him forget it) and were immediately confronted by the airport taxi cartel outside arrivals. We were initially offered a rate of 1100P, but had been told by our host that a cab could cost 300P. After heading back into the airport and out to the departures entrance, we found a cabbie that promised to use his meter. Turns out using the meter was a piece of paper with flat “meter rates” printed on it. It was “only” 600P though, much cheaper that our first offer, so at that point we figured whatever because it was late. On the cab ride we got our first taste of Filipino driving,- it turned out this is one of those countries where they don’t really believe in following space and they really like honking. We arrived at our condo (rented via AirBnB from a chill guy named Jeoff) unscathed though and then promptly fell asleep. Due to jet lag we both woke up at 6am and decided to go explore Manila. The condo was right by the LRT line so we thought we’d do like the locals do, which is apparently get packed together like sardines in a very sweaty train car for the low, low price of 15P each. Curiously (and slightly unnerving), the LRT has separate trains for “Females Only”, so I probably could have ditched Chris and rode in much less smelly ladies-only luxury, but I was worried I would lose him in the crowd. Although in retrospect I think I would have been able to see his head bobbing above the crowd, him being the only person there who was white and over 5’6″. Segregated “Female Only” waiting area at the LRT station. We took the LRT to Rizal Park, which is dedicated to Jose Rizal, National Hero of the Philippines (from what I can tell, it’s for being an all around good guy with lots of cool skills…Chris just yelled “He’s a polymath!” at me from across the room, so there’s that). Rizal Monument in Rizal Park, both named for National Hero Jose Rizal. After our public transit experience the park was nice and calm, so we wandered around a bit and then went over to check out the old buildings in Intramuros, the historical part of Manila. 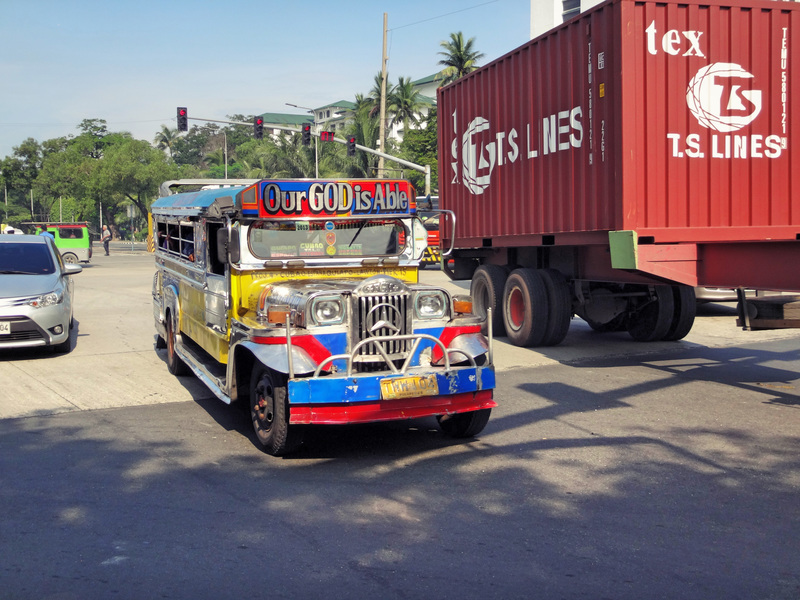 I spent a lot of time taking pictures of jeepneys, the Filipino equivalent of buses but waaaaaaay cooler looking. Each driver/owner decorates their own however they want it seems. By then we were pretty hot so we decided to walk along the bay front to the Mall of Asia because stupidly neither of us really looked at a map and we thought it was a lot closer than it actually was. It ended up being a long, long and exciting walk (there are a definite lack of pedestrian crossings here). We walked past the American Embassy and also had nice views of the ocean, if you ignore the vast amounts of garbage in the bay. Chris was dying from the non-European boreal forest climate so when the mall appeared like a mirage in the desert we immediately headed to the Hypermarket for Gatorade and air-conditioning, then wandered around for bit looking at all the crazy fast-food places we’d never seen before. A thing they seem to do at a lot of places here is have multiple security guards at every door checking your bags (they also had them at the LRT) so we had to take off our backpacks a gajillion times. With the thoroughness that they examine your bags though, I think you would have to be carrying a bazooka for them to notice. They also rub their hands along your lower back to check for a gun in your waistband, although at one point a sitting female guard seemed to just rub both our bums instead. 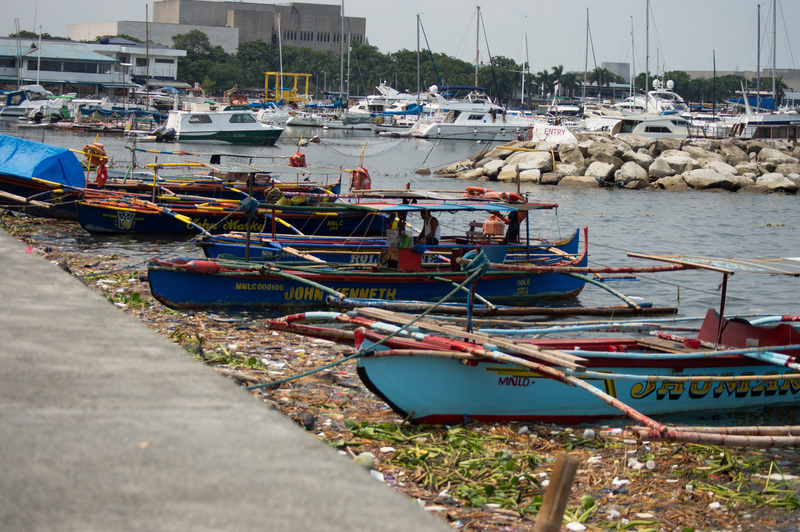 Fishing boats and garbage along the Manila Baywalk. When we got tired of shopping we went to see Ant-Man (because PAUL RUDD OMG, good in every country obviously) in literally the BIGGEST MOVIE THEATRE I HAVE EVER SEEN. We counted and there were at least 1300 seats in that thing, with only about 40 of them actually filled. When we wandered back out into the mall we walked into what I can only assume was some kind of “Philippines Best Dance Crew” competition, which was pretty amazing. Then we stuffed our faces with fried rice and chicken adobo and headed to bed. A dance crew doing some sort of coast guard routine at the mall. The next day we woke up freakishly early again so we decided to brave the LRT to go check out the markets in Chinatown. It was definitely an… experience, super crowded and full of people selling everything from bootleg movies to dildos to airsoft guns to fake diplomas. Chris started hating mankind after about an hour so we decided to spend the afternoon checking out some museums as a break from the crowds and exhaust fumes. Diplomas and licenses for sale in Chinatown. We went to the National Museum of the Philippines, which has two parts: the Museum of the Filipino People (anthropology/archaeology) and the National Art Gallery. The different areas of the museums are of varying qualities, some are shiny and new and some have seen better days. We saw a lot of portraits of strangers and also “transparent cubism”. In the museum we saw some artifacts from a Spanish shipwreck, a lot of vases, and some other things. During several sections we followed two Filipinas whose only goal in life was to take a selfie next to each exhibit and run on. Asian tourists are the same in their own country as they are in our’s apparently. The National Museum of the Philippines is located in the Old Legislative Building. Afterwards we hit the nearby SM City Mall for snacks and some random essentials before trying to catch a cab to the Ohayami bus station for our overnight bus to Banaue. Unfortunately it starting raining, making cabs in real short supply at the busy mall. Standing in the underground parking lot breathing yet more exhaust fumes while we waited in a fifteen person line for the next taxi was starting to make Chris go crazy. We had two options: we could wait and slowly asphyxiate, or we could lug our giant bags and wander the streets in the pouring rain. Luckily some mind-reading trike driver (or more likely, he saw two tourists wandering around with huge backpacks at 7pm and made a good guess) drove by and asked us “Ohayami?” so we decided to jump in and give it a go, even though I was a little concerned about his tiny bike pulling the weight of both of us and our bags. It was definitely a strain on his little engine, and it was clear he wasn’t used to the lack of maneuverability. However we actually made it to the bus station in amazing time, mainly because he didn’t seem to have any qualms about driving on whatever side of the road he pleased. The bus station turned out to be not so much what I consider a bus station but more of a ticket window with a bunch of benches outside. It was also right next to a couple major roads and therefore full of more exhaust and not really a great place to sit around, so we walked around until we found a nearby cafe to have tea at until our 10pm bus to Banaue. 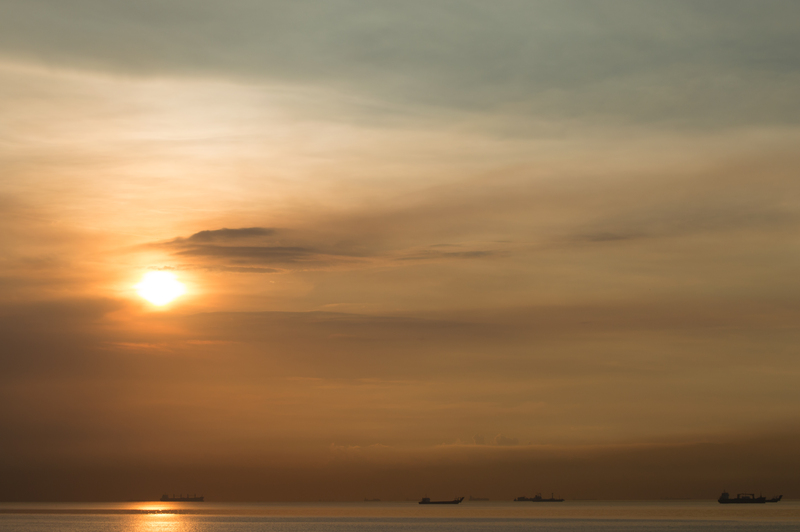 Manila is pretty hectic, but at least the sunsets are nice. All in all, Manila was definitely eye-opening and a wee bit crazy but not a place either of us has a burning desire to return to. Probably we are spoiled, being from Canada and all, but Manila was way too crowded and dirty for our taste. Next up though is Banaue, which is a whole different side of the country.